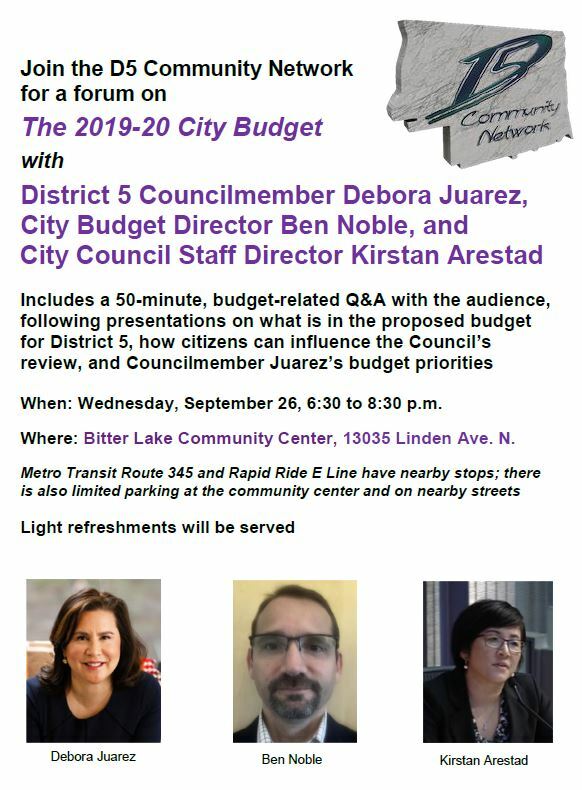 On September 26, the D5 Community Network is hosting a forum on the 2019-20 City of Seattle budget with District 5 Councilmember Debora Juarez, City Budget Director Ben Noble, and City Council Staff Director Kirstan Arestad. See the flyer below. The meeting will be from 6:30 to 8:30 p.m. at the Bitter Lake Community Center, 13035 Linden Ave. N.
This meeting will be a kind of training session for community advocates. You will hear highlights of what is in the Mayor’s proposed budget for key issues of interest to District 5, how citizens can most effectively advocate for the issues of most interest to them, and Councilmember Juarez’s priorities for this two-year budget cycle. There will be a 50-minute question and answer period for budget-related issues. By agreement with Councilmember Juarez, approximately half of this time will be set aside for written questions submitted that night, with additional questions submitted by community organizations in the district.